This utility is a COM add-in programmed in Microsoft® Visual Basic® for Application (VBA) that makes easy date and decimal number entry in Microsoft® Excel® format cell. See the pictures below. It consists of only one file, the CellEasyEntry.dll, which is about 144 kb in size and can be installed automatically using one of the installer package files available below to download. Except for the DLL, no other setting is saved in the Microsoft® Windows® Register. Its setting is saved in CellEasyEntry.ini and CellEasyEntry.xlam files that are created and maintained by the proper utility. You also can uninstall it automatically using the same installer file, leaving no mess on your Windows Register or disc. - Allows only numeric typing. - Auto inserts and always shows separators according to the format. - Can foresee some logical typing. - Can correct any illogical typing. - Illogical end of a month is corrected in the proper month not trying to resolve in possible format types like VBA CDate and DateValue functions do. For example: 02/31/05 is corrected to 02/28/05 not 02/05/1931. - Auto activates when selecting or double clicking unlock cells with date or decimal number formats. 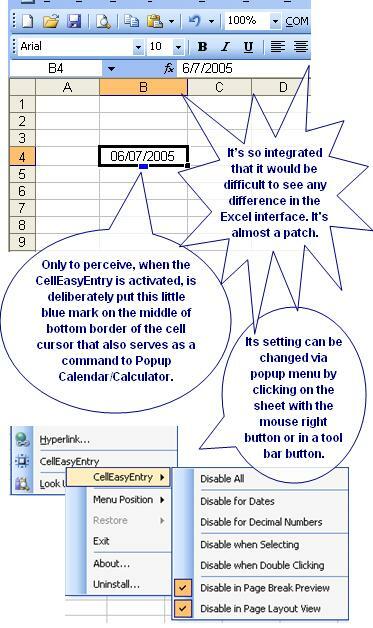 - You will immediately perceive how easy it becomes to enter dates and decimal numbers, but you might not notice any difference in Excel interface, if it didn’t deliberately put a small blue mark in the middle of the bottom edge of the cell cursor. - If you have installed a recent version of the Popup Calendar for Excel, that small blue mark become red and, if it’s clicked, pops up the calendar to pick dates (Date picker). Similar behavior for the Popup Calculator for Excel. - You can disable and enable quickly while editing a sheet via the mouse right button (Context menu) or by a button in the Excel Standard toolbar (2007, 2010, or 2013 Ribbon Add-ins tab). A menu of options appears to disable all or for specific disablements: Disable for Dates, Disable for Decimal Numbers, Disable when Selecting, Disable when Double Clicking, Disable in Page Break Preview, and Disable in Page Layout View. Tested in Excel 2000, 2002(XP), 2003, 2007, 2010 (32-bit), 2013 (32-bit), and 2016 (32-bit) in MSI-based and Click-To-Run installations of Office 365™ cloud-based services. Note: The above link downloads the installer and uninstaller package programmed in VBA in a XLS duly converted to EXE by the XLtoEXE to make the installation easier for macro and Microsoft® Windows® laymen; however, if you're an expert and for some reason prefer an installer and uninstaller package in open ZIP format, click here. With this zip package you can install it in three ways: (1) Simply initiate the Install.exe that loads the same XLS in Excel without macro alert; (2) Extract the entire package to a folder and initiate the XLS, enabling the macros in Excel and using 123 as password, or (3) Install the DLL manually.